The NSW Government has been trialling their Fridge Buyback Scheme in Sydney for a while now, and starting next month the scheme will be broadened to include the Illawarra. At this stage it will only encompass the Wollongong and Shellharbour Council areas, but hopefully it will extend to Kiama in the near future. The scheme aims to encourage people get rid of their big, old spare fridges (larger than 250 litres and older than 10 years), by paying owners $35 for them. These old clunkers cost on average $190 a year to run, resulting in 1 ton of greenhouse gas emissions annually. Experienced removalists will come to your house to pick up the fridge; the refrigerant gasses are removed and safely disposed of and the rest of the parts are recycled. So far the program has collected over 7,000 old fridges, and it is estimated that there are 27,000 qualifying second fridges in the Wollongong and Shellharbour areas. That could save the region up to 27,000 tons of greenhouse gas emissions and $5 million in energy bills per year! 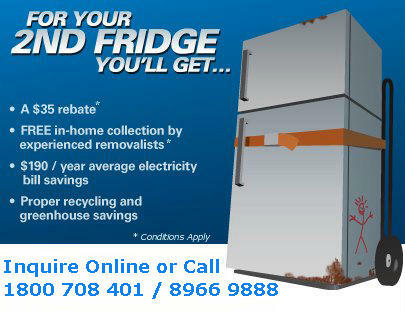 If you’re interested, check out the Fridge Buyback Scheme web site or phone 1800 708 401. This project is being funded by the NSW Government’s Climate Change Fund. I have a spare bar fridge at home which is just sitting idle. Shame my fridge does not qualify (doubt it is 250L). But that’s a great way to encourage people to get rid of their old-energy inefficient fridges. However it will also result in my landfill space used for all these fridges. I guess its a lesser of two evils. that’s alright as long as the bike can keep me ‘cool’. I agree – it would great if they did a similar scheme for all those spare bar fridges! @Chrissy: Too true. Those little bar fridges are very inefficient for the quantity of stuff they hold. Part of it is that the insulation is so thin, so the fridge can be small on the outside but big on the inside. Still, it’s the big clunkers that use the most electricity, so they’re the ones that are being targetted. It is a great scheme – but just to clarify a few things, to be eligible, the fridge needs to be in use as a second fridge, it must be working and if there are more than 6 stairs the rebate isn’t available. @Natalie: Yep, there are conditions. The web site contains them all, and if you ring the number they’ll explain them to you. I don’t like to list all the conditions on these kind of posts, because they sometimes change and I’d hate to be giving people false information.